From Activity Meter’s home (Overview), click on a student’s name to view details on all of his or her activity. This is one of the most beneficial views of Activity Meter, as it allows instructors to view all of a student’s work in one page. Additionally, it allows instructors to see exactly what students see in their View of Course Map! At the top of the individual student’s details, you will see their enrollment status and a summary of their activity. *Items missed refers to items whose dates are now past due. Surveys are not included in the items completed or missed in students’ detailed views. This is to protect the anonymity of the submitters of surveys. For the same reason, you cannot know who submitted a survey. You can only view how many submitted with details under grading in AT&S, but not who said what. 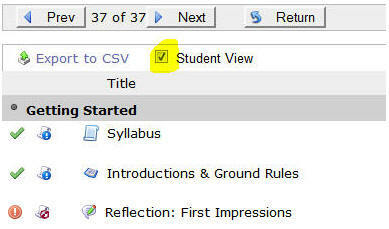 The “Student View” control is checked by default (see screen shot). What you see in this view is identical to the student’s view of Course map, except that you don’t have hot links to go to the items to submit work. You can see how much has been done (count) by the student, theirs score (if graded), and date of last submission or post. Open and due dates of items are listed for your convenience. You can also review what they submitted for an assignment and your comments. If you un-check “Student View,” you will see an unfiltered view of Course Map, the list will include unpublished, invisible and invalid items which students don’t see. The items that are invisible to students in CM are opaque and have a grey background, making it easier for you to review all your course items, and what you want students to see and access. You can click on “View Work” and review what students submitted for an assessment (including access to multiple tries) or the posts they contributed to a discussion, and the feedback that you gave them. The “View Work” screen(s) displays all the details of submissions or posts. View Work basically is another door to your grading view for a particular student’s submission(s) for an assessment. The “View Work” link is equivalent to the students’ “Review” link. The difference is that students get “Review” when / if you allow it, whereas instructors get to view students’ work from Activity Meter at any time, even if the student is blocked or has dropped the course. In this view, you can see if students have not reviewed your feedback. It will be indicated by a yellow alert on a comments icon. Green checks indicate completed items, accompanied by details on when they finished, count, and score, if applicable. Items that have not yet been mastered (students scored below the mastery level value) are flagged. In-progress work is highlighted with an ‘in-progress’ icon. If the item is closed, the information icon reflects its status. Clicking on it will give you the date that it closed. If an item has a prerequisite attached to it, the information icon has a lock on it. Clicking on the icon will provide information on the prerequisite requirements that you must complete prior to continuing to the next item in the course. Indicates that the student has not reviewed your feedback since you last edited it. A navigation bar, with Prev / Next buttons, allows you to move through your entire class and evaluate everyone’s individual activities and progress, without returning to the list. You can export all of a student’s activity in a CSV file for offline reviewing in Excel or for backup purposes. Conveniently located in this view is the ability to send PM to students while you are evaluating their class progress and activities.